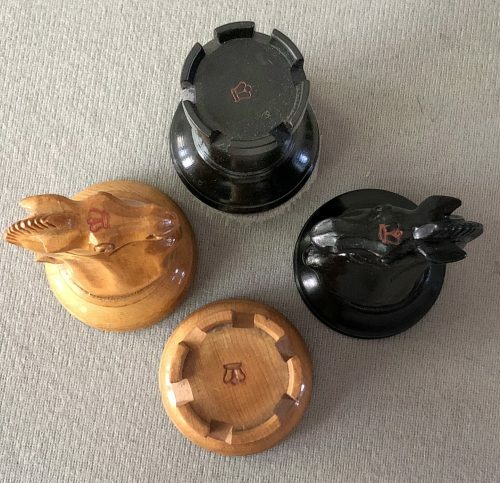 Offered here is a fine set of Club Size Boxwood and Ebony Antique Ayres Staunton Chessmen, or more commonly the SCA chessmen. This set of chessmen has a 4.2″ tall by 1.8″ diameter base King. The chessmen are weighted and stand atop green baize cushioned bases. 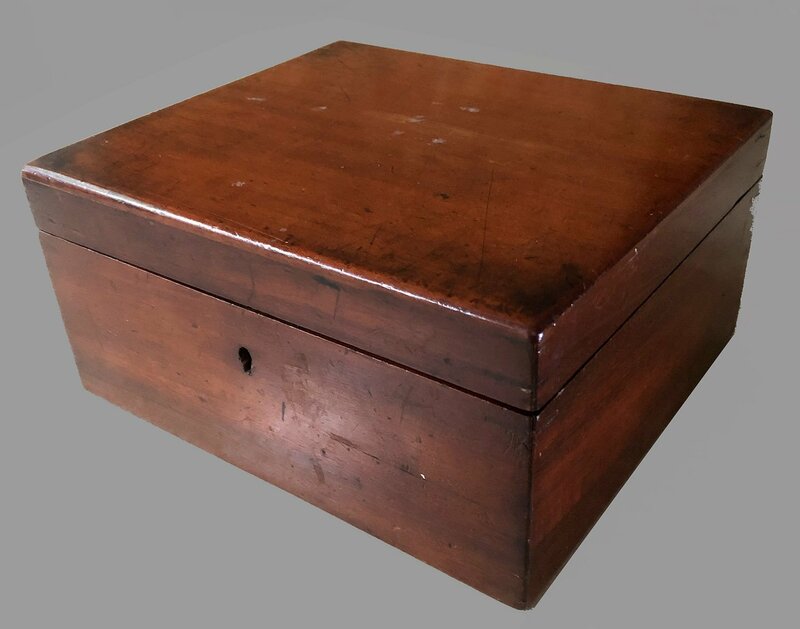 The chess pieces are housed in their original undivided, large Mahogany hinge-top box which is lined in its original English green baize.This particular set of Staunton Chessmen were produced by Ayres around 1890. These earlier sets featured a very detailed Knight heads which bore a striking resemblance to Knights produced by John Jaques of London. There are crown impressions on the summits of the Kingside Rooks and Knights. 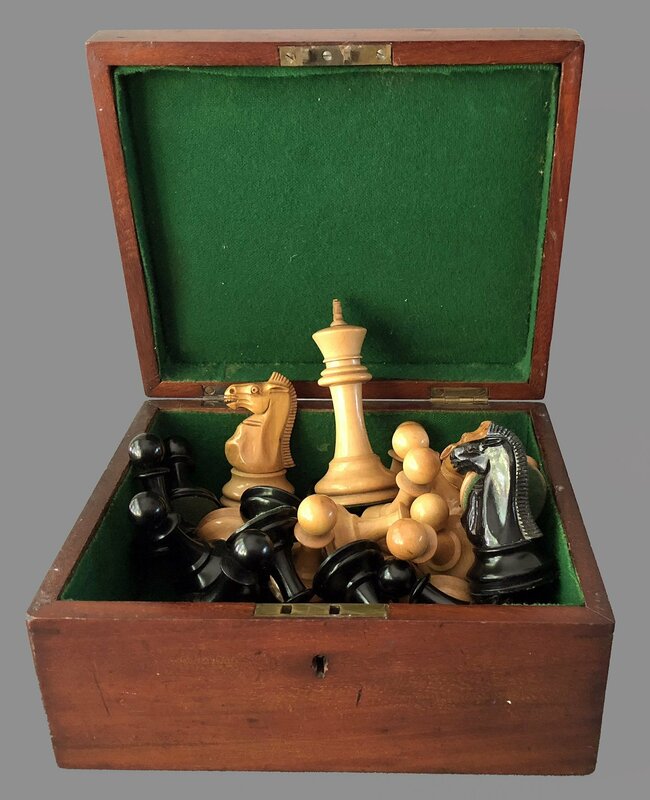 These Antique Ayres Staunton Chessmen play and display best on a chessboard with 2-3/8″ or 2-1/2″ squares. The chessmen are in excellent condition. The chessboard shown is not included, but a suitable chessboard can be found here. This style of chessmen is often attributed to F. H. Ayres or The British Chess Company. Probably, the most appropriate moniker that should be applied when referring to them is SCA (So Called Ayres) Chessmen. Regardless who actually produced this chess set, they are of very high quality, almost the equal of Jaques of London chessmen from the 1930s. F.H. Ayres was an English sports and Games manufacturer and retailer dating back to 1810, doing business in Aldersgate in the city of London. It is known from various ads that they produced and sold Chess sets of various quality and styles. However, despite putting their name on most of their other products, they never put their name on their chess sets. 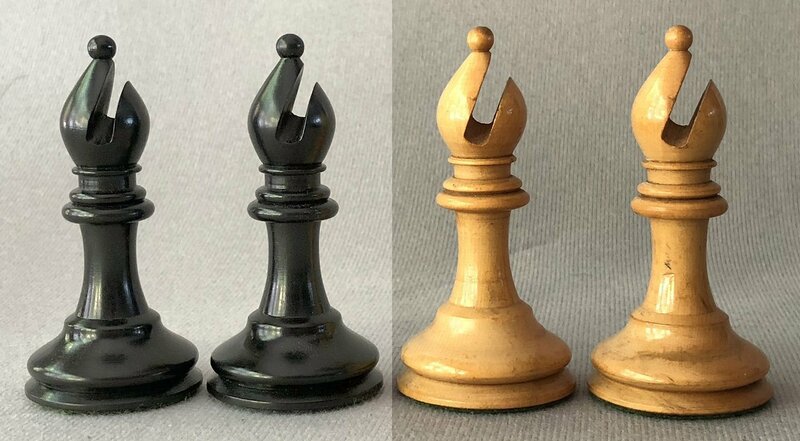 This has led to a real problem of identifying which style Staunton chessmen they did produce and whether they sold them at the retail level or only wholesale to retailer or other manufacturers. A report in the June, 1895 issue of Strand Magazine, by William G. Fitzgerald, documents visits to several London firms that made sporting goods. The visit to F. H. Ayres takes up most of the space in the article. The article contains many images, though not actual photographs, but ‘half-tone’ images. Information on the British Chess Company can be found here and in the following article. 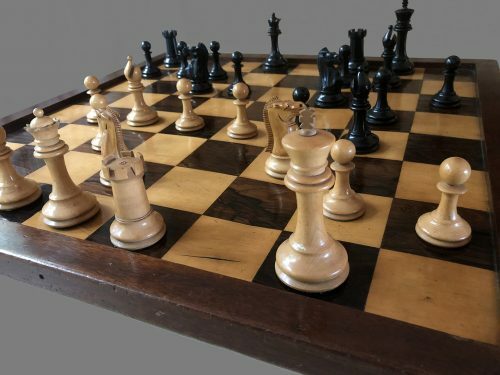 All this has led to a running debate – What is an Ayres Chess set? The argument in favor of Ayres goes something like this. “Ayers made wooden chessmen. 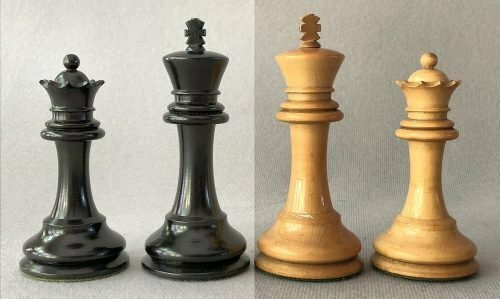 This is a set of wooden chessmen. ergo, Ayres made these chessmen. other than that argument, nothing more substantive has been put forward supporting the thesis that these sets were made by F. H. Ayres. 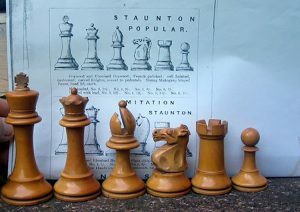 The image to the left is from an Ayres ad for their Staunton chessmen. Compare this image with the chessmen offered here and elsewhere, claiming to be made by F. H. Ayres. It is not very convincing. The observation in the Strand Magazine article that Ayres employed twenty craftsmen making chess sets does not suggest a very large operation. Also, please note the attached ad for Ayres chessmen. It does not appear to looks anything like the set we are discussing (image attached). At least, the BCC ads closely resemble their sets as my previous email clearly shows. At the end of 1891, BCC produced its first catalog illustrating their registered designs. 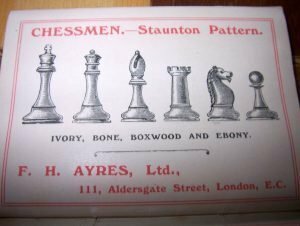 However, aside from a few ads by Ayres illustrating rather ubiquitous images of Staunton chessmen designs, there was never a catalog produced by Ayers illustrating the range and prices of chessmen offered by them nor any supporting images of their various designs. here have been some suggestions that these sets were made by a different company (Jaques or BCC) but so far no documentary evidence has been produced to support or refute this assertion.